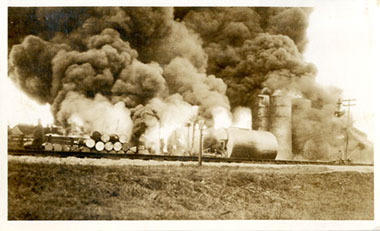 "Fire at Wilmington, Ohio, Jan. 26, 1929 when James H. Wayland was burned. It was a $65,000.00 fire. Two oil companies were partially destroyed. Mostly the Wilmington Oil Co. Partly destroyed the Home Oil Co., too." No cause for the explosions were reported in the Wilmington newspaper. It was reported that James Wayland, 24, a salesman for Wilmington Oil, ran into the loading shed after the first explosion to look for two boys who had been playing nearby. He was caught by the second explosion, his clothes saturated with flaming oil. He died March 29th, after weeks of medical treatment. He was the son of Posey James Wayland and Isabelle Woodward Wayland, and left a widow, Marie Bowman Wayland, and two children Virginia June and Wanda Lee (b. April 2, 1928). Marie married Wilbur Davis June 1, 1929, and the family is in Wilmington, Clinton County, Ohio in 1930. The girls are listed as Davis' daughters, although they use the Wayland name later.